Watch DVD Movies with iPad on the Go! DVD to iPad Converter is the highly optimized iPad video conversion software specially designed for Apple iPad owners. This DVD to iPad Converter can convert DVD to iPad compatible video/audio formats, it also supports iPad video conversion from AVI, WMV, MKV, FLV, etc. What makes this video converter for iPad the best is the full support to almost all popular video formats. You can use it as video converter for iPad, iPhone, iPod, Apple TV, Blackberry, PSP, Zune, Zen, smart Phone and other media players. 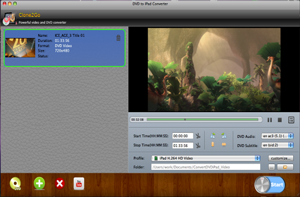 DVD to iPad Converter comes with powerful video editing features such as trimming video length, selecting audio track and subtitle, customizing output profile, etc. Besides, the built-in Free YouTube Downloader allows you to download YouTube videos for free. You can save YouTube videso as (HD) MP4, FLV or 3GP files directly to iPad and other devices. Convert DVD to iPad compatible videos with this DVD to iPad Converter, one-click to convert DVD to MP4, H.264, MOV, MPEG4 with tailored profiles. It is also a DVD audio ripper for iPad, extract sound tracks from DVDs and save them as MP3, M4A, AAC or WAV format for your iPad. Select DVD Audio Track and Subtitle. Trim DVD movie, select any segment of a movie to convert to iPad video clip. DVD to iPad Converter comes with built-in mini media player which allows you to preview video source instantly when a DVD disk being inserted into DVD-ROM. You can select DVD Audio Track and Subtitle to your own language. What’s more, Socusoft has built this DVD to iPad Converter tool with more fancy features, such as the capabilities to customize video bitrate, size, frame size, audio bitrate, sample rate, etc. » Convert DVD to iPad H.264 video, iPad H.264 HD video, iPad MPEG-4 Video. » Extract sound tracks from DVD as MP3, M4A, AAC or WAV format for iPad. DVD to iPad Converter is the best iPad video converter you can use to convert all popular video formats to iPad video/audio formats, such as AVI to iPad, WMV to iPad, MKV to iPad, 3GP to iPad, MTS to iPad, FLV to iPad, MPG to iPad, DV to iPad, RMVB to iPad, ASF to iPad, RM to iPad, etc. Extract audio from videos like AVI, FLV, MTS, FLV, MKV to iPad compatible audio formats MP3, M4A, AAC, WAV. Import videos from DV camcorders, convert DV camcorders' videos to iPad format. 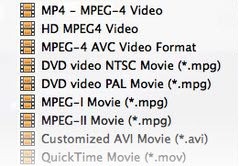 Rip DVDs to any video audio formats for your portable players, including MP4, AVI, FLV, MOV, 3GP, WMV, M4V, etc. Convert video to any formats, such as AVI, WMV, MOV, MP4, 3GP, M4V, QT, RM, RMVB, FLV, MKV. Extract audio from DVD and video files into MP2, MP3, OGG, WAV, M4A, AAC or AMR format. Fully support portable media players including iPad, iPad 2, iPad with Wi-Fi+3G, iPod, iPod touch 4, iPhone, iPhone 3G, iPhone 3GS, iPhone 4, PSP, BlackBerry, Apple TV, Nokia, Gphone, LG, Motorola, Sony Ericsson, Samsung, PSP, PS3, Xbox, Walkman, etc. Best DVD to iPad converter convert DVD to iPad/iPad 2. Enjoy DVD movies with your new iPad on the Go! How to Convert DVD to BlackBerry? All-inclusive: DVD to iPad Converter + iPad Video Converter + Video Converter for iPhone / iPod / PSP / Blackberry /.... You can achieve a lot more besides converting DVDs and videos to iPad.